Canadian sprinter Andre de Grasse will miss the World Athletics Championships with a hamstring tear. The 22-year-old was regarded as one of Usain Bolt's main challengers for the 100m title in London. De Grasse won 200m silver, 100m bronze and 4x100m relay bronze at Rio 2016 and ran a wind-assisted 9.69 seconds in Stockholm in June. "Injuries are a part of the sport, and the timing of this one is especially unfortunate," he said. "The entire year this 100m race in London was my focus. I am really in the best shape of my life and was looking forward to competing against the best in the world. To not have this opportunity is unimaginable to me but it is the reality I am now faced with." His manager Paul Doyle added: "We tried to do everything we could to have him ready but he's just not going to be ready. "Further MRI results today showed it's probably going to be another four to six weeks before he's fully recovered. 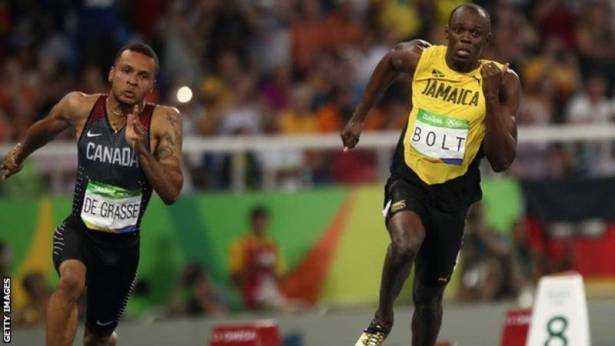 "So unfortunately he's out of the 100m, 200m and the relay and done for the season." The World Championships run from 4-13 August.